Any review of Crieff Drama Group’s summer production of Strathinver must begin with an appreciation of the extraordinary script, written between 1982 and 1983 at a point in Robin Bell’s life when a serious accident provoked a creative retreat into the certainties and safety of childhood. Sub-titled “A Portrait Album 1945-1953”, Strathinver is the story of a small town in what Naomi Mitchison calls in her Foreword “middle Scotland”. Robin was born in 1945, and brought up at the Manse in Aberuthven where his father was Minister. These are the people of his childhood – sharply and sometimes affectionately recalled, always with a poet’s eye, and a deft sureness of touch. Written in a swinging free-verse form, it presents a gallery of characters, the six sections reflecting the particular lives and roles of the men, women and children of a world now so far removed from our own and yet, for many of us, within our living memory. Strathinver was written as a radio play, and in 1985 won the Sony Radio Academy Award for Best British Documentary, performed by a stellar cast. How did it fare as a stage production from the increasingly ambitious players of Crieff Drama Group? The answer is, very well indeed. The six actors, Helen Day, Colin Morrison, Mike Owens, John Cummings, Ann Morrison, and Elspeth Fleming, did full justice to a production which seized mind and imagination alike. 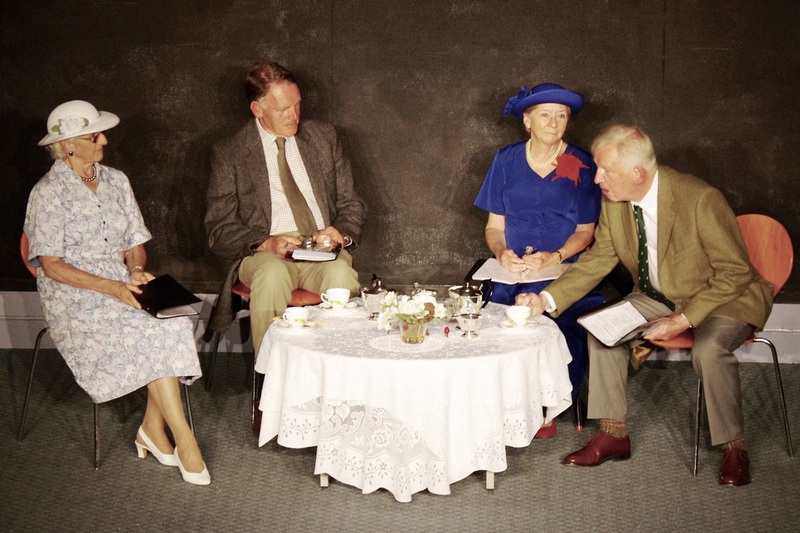 The clever staging, four central actors rotating round a daintily set tea table, with Elspeth and Colin providing introduction or commentary in the role of Chorus, gave weight and authority to the script rather than the action. Yet these experienced performers, often through just the hint of a movement or a change of expression, made certain that this was a dramatic performance and not just a staged reading, and from the first we were aware that the actors’ skill this evening lay in understatement. From Helen’s scene-setting “One Day They Put Out the Flags” to John’s final portrait of the tenant farmer whose 80th birthday bonfire became the blaze “for John, for Tensing and the Queen/ and to drive out the last shadows of the war”, we were treated to a series of cameo performances, stretching the players’ art and calling for a consummate command of voice and movement. The voices ranged from sly (Ann, as Jean Ross – the telephonist); to grim (John with the brutal ending to the Garage Owner’s Tale); to witty (Helen as Nancy Scott, the local femme fatale); to sarcastic (Mike as Henry MacLeod and – until he’s “caught” – Jamie Douglas); to affectionate (Mike and Ann as the Minister of Strathinver Old and his wife); to wickedly accurate (John and Helen as their rivals in Strathinver West); to bathetic (Helen as Phyllis Hall, organist and piano teacher); to sneering (who else but John, as Headmaster of Strathinver High School); to tragic (Ann’s account of Eric Young); to gentle (Mike with “The Deaf Boy)”; to gently teasing (Helen with “Kirsty Gilmour”); to richly comic (Helen with “Eck Skinner the Orraman”). The roll-call is as long as the programme, and the programme gave us so much to savour. Crieff Drama Group continue to go from strength to strength. This was a remarkable performance from a talented cast. Robin Bell’s direction and the actors’ response made for a memorable success.